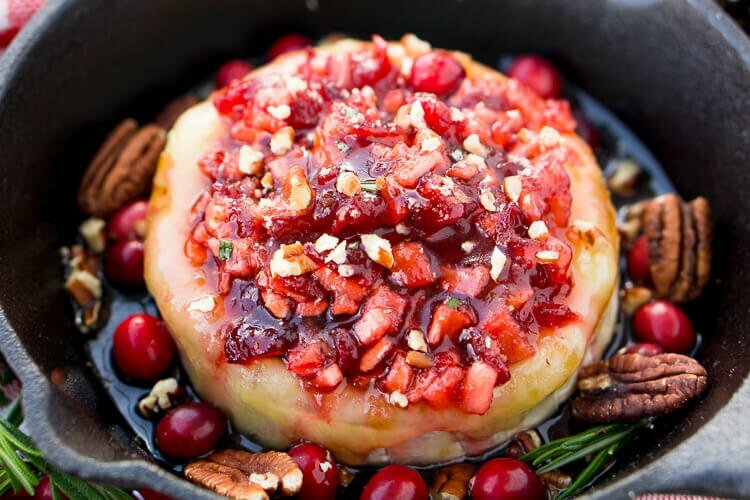 Apple Cranberry Baked Brie is a delicious cheese appetizer loaded with brown sugar, maple syrup, pecans, and an apple cranberry compote. Brie seems to have become a staple of the holidays for many in the last few years. 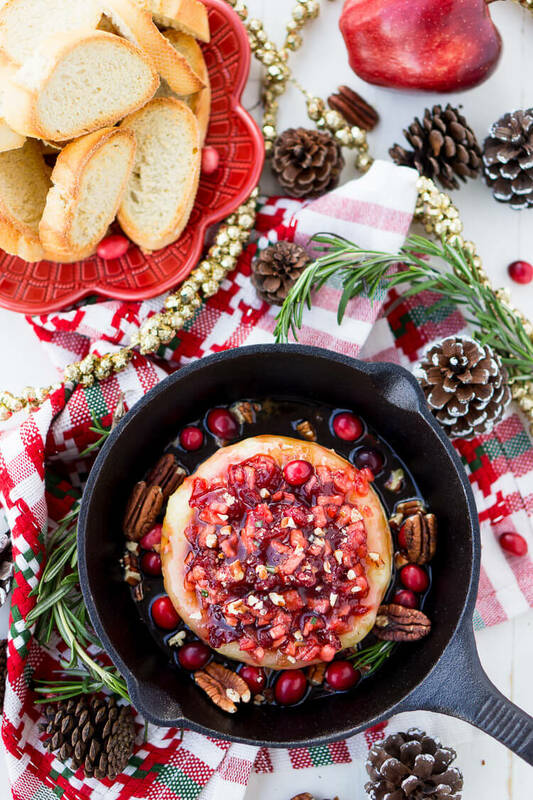 On its own, it’s a bit of a boring cheese, but load it up with fruit, nuts, and syrup and we’re talking serious holiday appetizer greatness. 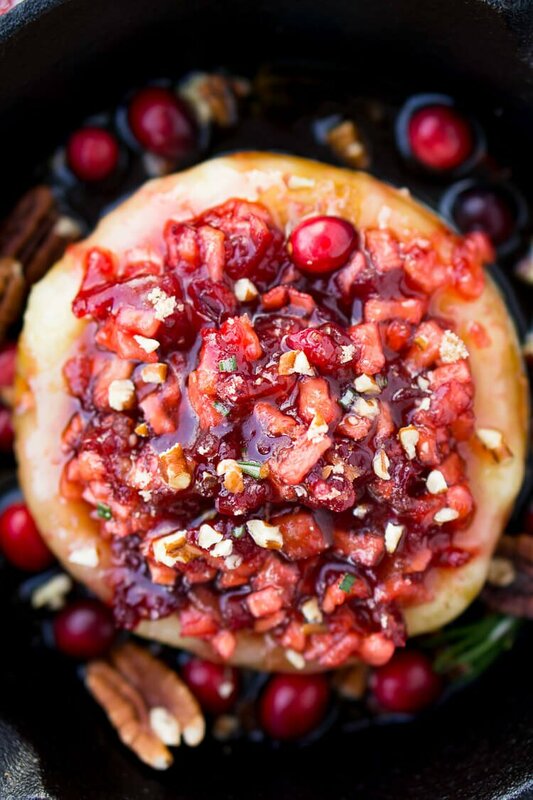 And this Apple Cranberry Baked Brie will now be a must-have addition to your holiday menus. 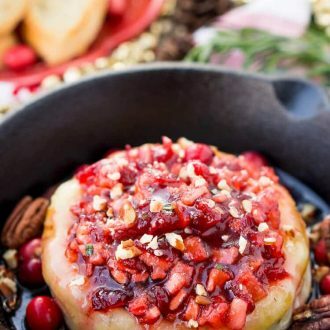 I always make my Holiday Jam and Brie Crostino, it’s an easy appetizer that hits the spot and is perfect for grabbing as a finger food. But a few months ago, I took my Nana and Great Nana out to lunch at one of my favorite restaurants, Delvino’s in Belfast. 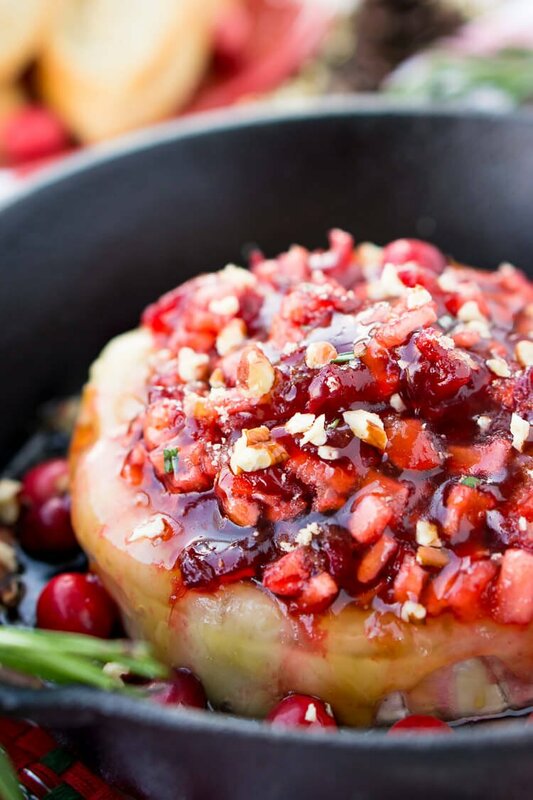 Normally, I’m all about the bacon wrapped scallops with a maple mustard sauce, but the Apple Cranberry Baked Brie on the fall menu caught my attention this time, so we got it! And I fell in LOVE! As soon as that first sweet and tart bite hit my taste buds, I knew this was a dish I was going to have to recreate at home! 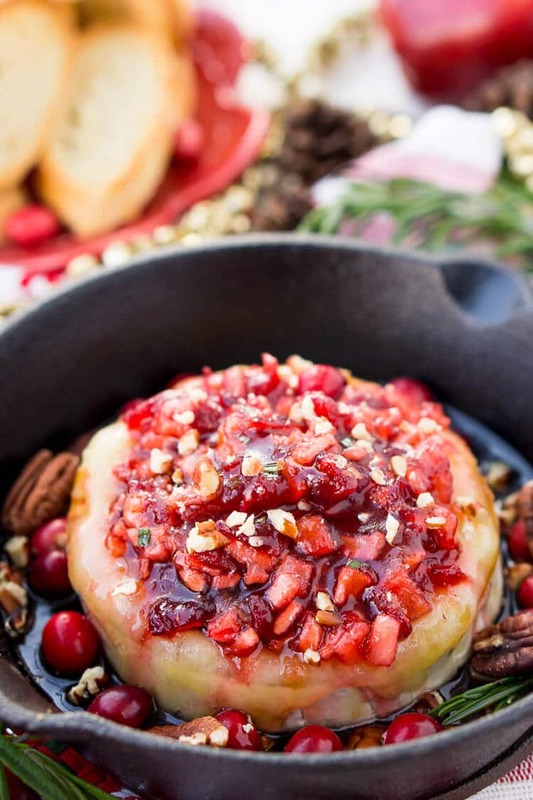 This Apple Cranberry Baked Brie embodied that perfect mix of holiday flavors. If I was on my game, I would have served this up at Thanksgiving as well, but it’s definitely going to be a Christmas staple from here on out! I added some pecan pieces to the mix for a bit of texture and the bit of maple syrup just highlights the tart fruit compote and makes it all the cozier! 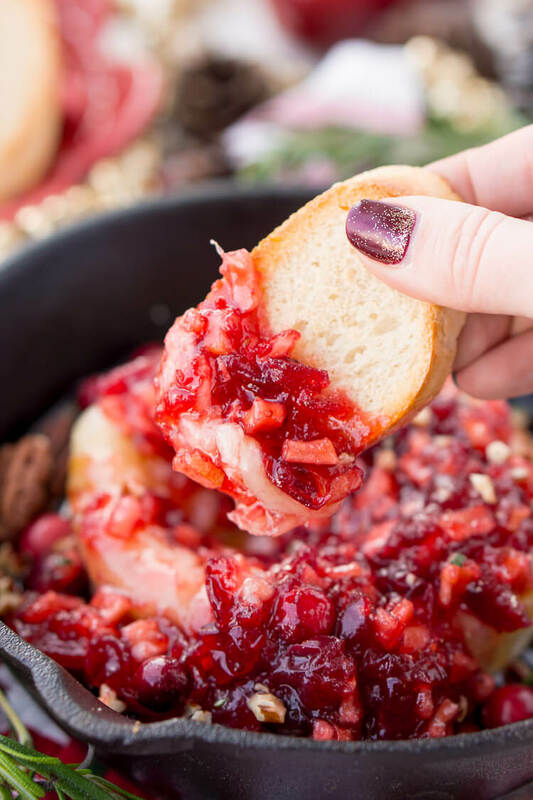 When you dip that baguette slice down in this baked dish of goodness, you’ll come away with a bite of soft cheese loaded with flavor and holiday cheer! Preheat oven to 350 degrees F. Lightly grease a 5-inch cast iron skillet, or line a small baking sheet with parchment paper and set aside. Slice the top rind off the wheel of Brie, leaving rind on the bottom and sides. Place the Brie bottom side down in the skillet or on the pan and sprinkle with 1 tablespoon of light brown sugar. Bake for 12-15 minutes until cheese is bubbly and soft. Meanwhile, begin making the compost by whisking together the apple juice or cider, corn syrup, and 1 tablespoon light brown sugar in a small saucepan. Boil over high heat until reduced in half, about 5 to 7 minutes. Add in 2 tablespoons of butter and stir until melted, then remove from heat. Melt the other 2 tablespoons of butter in a large skillet over medium heat. Add the apple pieces and cook for 2 minutes, coat them with the butter and stirring occasionally. Add in the cranberries and sugar and stir frequently until cranberries begin to pop, about 2 minutes. Stir in the apple juice mixture and boil until reduced to a syrup consistency. Use the back of the spatula to squish the cranberries. Spoon compote over the baked Brie and sprinkle with nuts and drizzle with maple syrup just before serving. Serve with toasted baguette slices or crackers. Compote can be made one day ahead of time, store in the fridge in an air-tight container. Warm up in the microwave before topping the Brie with it. Pears make a good substitute for the apple. More sugar can be added if desired. Compote adapted from Epicurious. YAAAS girl! Like most things involving cheese, this has me drooling like a fool. But this isn’t just delicious-looking, this is stinking gorgeous. I mean, talk about a guaranteed in-law pleaser! Can’t wait to try this!